Robert Wilhelm Ekman (1808–1873), Väinämöisen Playing, (1857-66), oil on canvas, 390 x 283 cm, Vanha ylioppilastalo, Helsinki. Wikimedia Commons. Most – perhaps all – societies have their own mythologies which shape their culture and collective identity. Oddly, until recently most European narrative painting has depicted myths from ancient Hebrew, classical Greek, or Roman societies, rather than those to which the artist belongs, as if their own cultural heritage was somehow inferior to those ‘classical’ cultures. The one stark exception to this is in Finland. Although there have long been societies and cultures in what is now Finland, from 1216 to 1917 the area was ruled first by Sweden and then by Russia. The rise in interest in Finnish folklore and culture during the nineteenth century was an important part of the development of the Finnish nation. In the early part of the nineteenth century, several scholars started to make formal collections of the runes or songs of Finnish folklore. Among them was a polymath named Elias Lönnrot (1802-84), who made long trips into the countryside of Karelia, the east of Finland which now runs into Russia, from 1828 onwards. Realising that these could fit into a substantial epic poem, he gradually built the fragments into a greater whole. In 1835, he published his first attempt to assemble them into the Kalevala, that version now being known as the old Kalevala. His research continued, and in 1849 he published a second version which has become accepted as the definitive epic, the Kalevala that is today the Finnish national mythology. It has since inspired almost every Finnish creative, including most famously Jean Sibelius, and the painters whose works I show below, and in the next article about the greatest of the painters of the Kalevala, Akseli Gallen-Kallela. The Kalevala is long, consisting of fifty separate songs and 22,795 verses, and its narrative is protracted and very complex. At the end of this article I have reprinted an English summary from WF Kirby’s translation of the whole Kalevala. Robert Wilhelm Ekman (1808–1873), Ilmatar (1860), oil on canvas, dimensions not known, Ateneum, Helsinki. Wikimedia Commons. 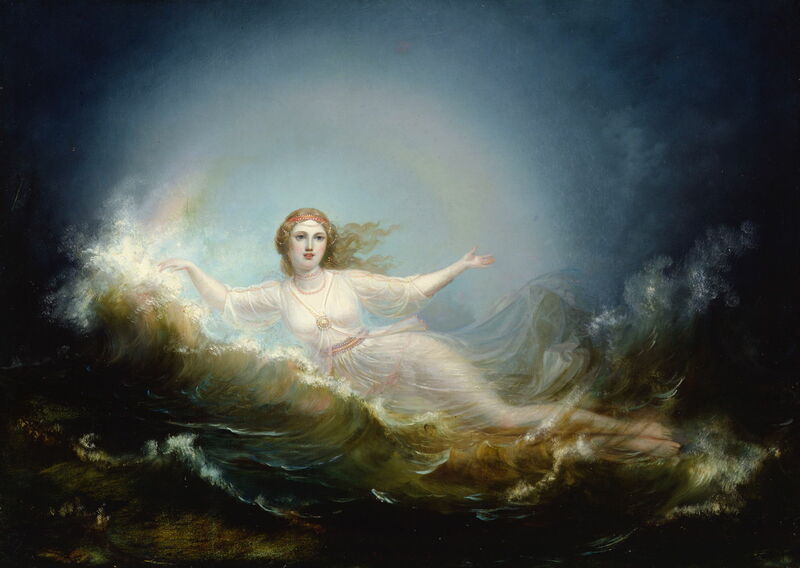 Ekman’s Ilmatar (1860) shows the daughter of the sky, herself the virgin spirit of the air, who is impregnated by the sea and wind, then models the earth, and gives birth to Väinämöinen, who swims to the shore. This is the start of the creation myth detailed in Song 1 of the epic. 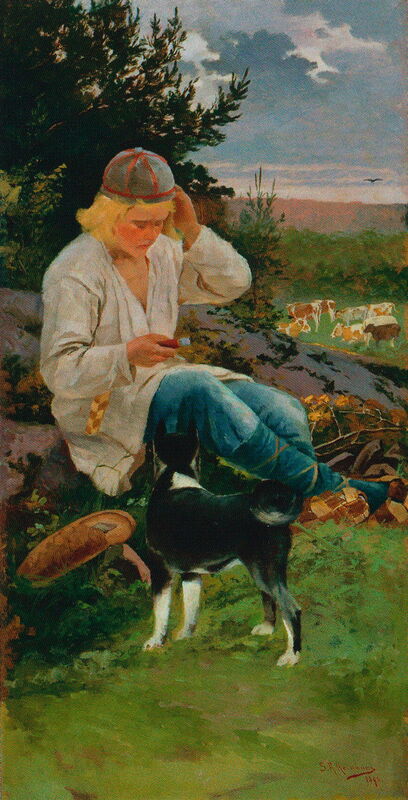 Sigfrid August Keinänen (1841-1914), Väinämöinen and Aino (1896), oil on canvas, 126 x 67 cm, Private collection. Wikimedia Commons. Keinänen’s Väinämöinen and Aino (1896) shows a scene from Song 4. 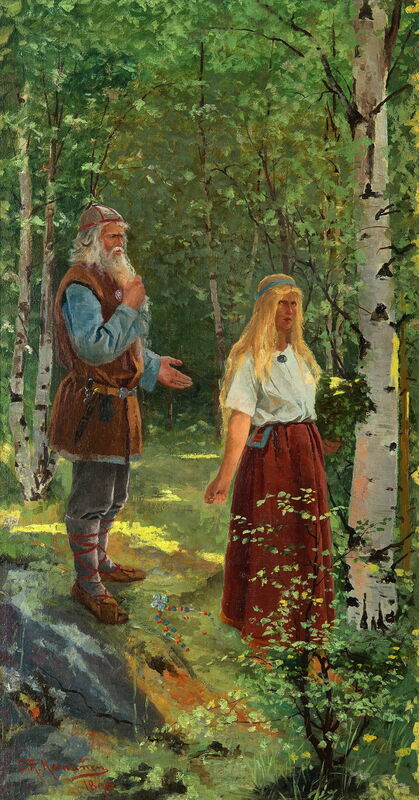 Väinämöinen, the central figure and hero of the epic, first meets the young girl Aino in the forest, and asks her to be his wife, shown here. She runs home upset, angry, and in tears, and tells her mother. Her mother tells her to stop crying, and to be joyful. Aino, distressed by the prospect of marrying an old man, wanders off, arrives at the shore of a strange lake, and drowns when trying to wash in the lake. 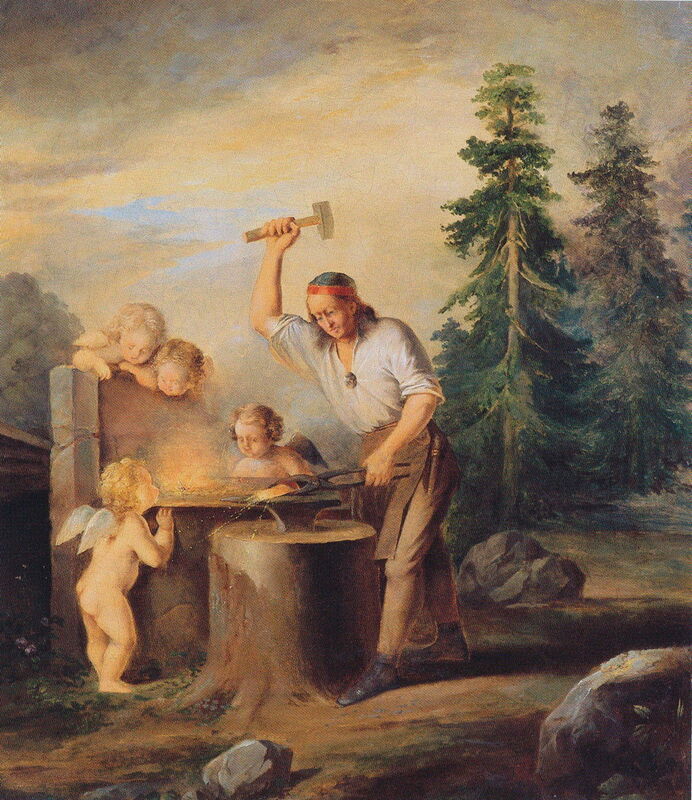 Berndt Abraham Godenhjelm (1799–1881), Ilmarinen Forges the Sampo (date not known), media and dimensions not known, The Finnish Literature Society, Helsinki. Wikimedia Commons. Godenhjelm’s Ilmarinen Forges the Sampo (c 1860) shows one of the most popular scenes, from Song 10. Väinämöinen returns home, and urges Ilmarinen to go to court the Maiden of Pohjola, who can be won by forging a Sampo (a mysterious talisman whose nature is open to speculation). When Ilmarinen refuses, Väinämöinen uses magic to transport him to Pohjola in a whirlwind. Once there, Ilmarinen forges the Sampo (shown here), but the Maiden declines his offer of marriage, so he returns home disconsolate. Ekman’s Lemminkäinen’s Mother Gathering her Son’s Body from Tuonela’s River (1862) is drawn from Songs 14-15. Lemminkäinen is assigned three tasks in order to win the hand of the Maiden of Pohjola in marriage. He completes the first two, but the third takes him to the River of Tuonela, where he is killed, his body dismembered, and cast into the river’s rapids. His mother finds out that he is dead, so she takes a rake to the rapids, where she recovers her son’s body parts (shown here), joins them together, and uses charms and ointments to resuscitate him. Sigfrid August Keinänen (1841-1914), Kullervo with His Herds (1896), oil on canvas, 110 × 63 cm, Ateneum, Helsinki. Wikimedia Commons. Keinänen’s Kullervo with His Herds (1896) shows narrative from Songs 31-33. Untamo lays waste the territory of his brother, leaving just one surviving woman, who is pregnant. She gives birth to a son, Kullervo, who – while still in his cradle – vows vengeance on Untamo. Kullervo is abused as a child, and brought up as a slave. As he grows up, he spoils everything that he touches. He is sold as a slave to Ilmarinen, who sets him to work herding cattle. Ilmarinen bakes a stone into the bread for his lunch, and when Kullervo tries to cut the bread, he ruins his knife (shown here), which is his only memento of his family. The remaining two paintings show the same scene from Songs 40-41. When Väinämöinen is on his way with Ilmarinen to Pohjola to get the Sampo, they catch a huge pike, kill and eat it. Väinämöinen makes a kantele (Finnish harp) from its jaws, but no one else knows how to play it. Väinämöinen plays it so beautifully that all creatures make their way to listen to him playing, and all weep with emotion. Väinämöinen’s own tears fall into the water, where they become blue pearls. 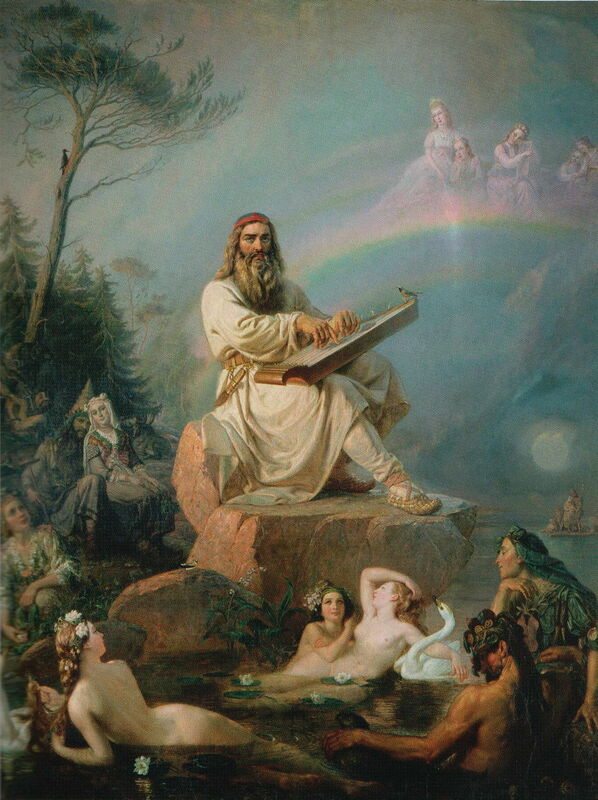 Ekman’s Väinämöinen Playing (1857-66) shows Väinämöinen playing his kantele, with a bird perched on it, and people congregating in the water, on shore, and on a rainbow even, to listen to him playing. 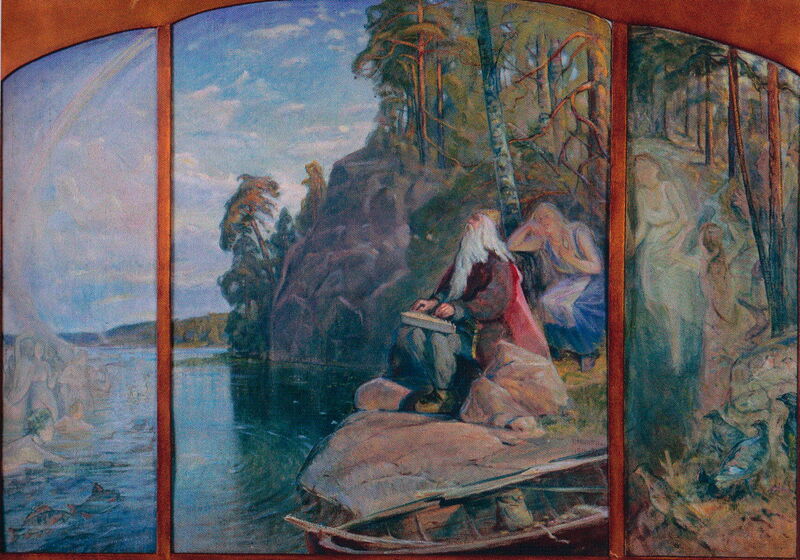 Elias Muukka (1853-1938), Väinämöisen Triptych (1914), media and dimensions not known, University of Turku. Wikimedia Commons. Elias Muukka’s Väinämöinen Triptych (1914) is more barren, and appears to have been set before any birds, beasts, and other humans have arrived. The second and final article in the series will consider Akseli Gallen-Kallela’s paintings of the Kalevala. The text, translated into English by WF Kirby from Project Gutenberg (free). Audiobook in English translation (WF Kirby) from LibriVox (free). List of translations, with links, on Wikipedia. Mäkinen K, tr Brooks K, illustrations by Pirkko-Liisa Surojegin (2009) The Kalevala, Tales of Magic and Adventure, Simply Read Books. ISBN 978 1 897476 00 0. A very accessible and beautifully illustrated retelling in prose. Pentikäinen JY, tr Poom R (1999) Kalevala Mythology, expanded edn, Indiana UP. ISBN 978 0 253 21352 5. The world’s best collection of paintings of the Kalevala is in the Ateneum in Helsinki, which also contains many other fine works by Finnish artists. It is a day well spent in a lovely city, although you will probably prefer to visit in the summer, as Helsinki can get quite bitter in winter. Song 1. After a preamble by the bard, he proceeds to relate how the Virgin of the Air descended into the sea, was tossed about by the winds and waves, modelled the earth, and brought forth the culture-hero Väinämöinen, who swims to shore. 2. Väinämöinen clears and plants the country, and sows barley. 3. The Laplander Joukahainen presumes to contend with Väinämöinen in singing, but is plunged by him into a swamp, till he pledges to him his sister Aino; after which he is released, and returns home discomfited. But Aino is much distressed at the idea of being obliged to marry an old man. 4. 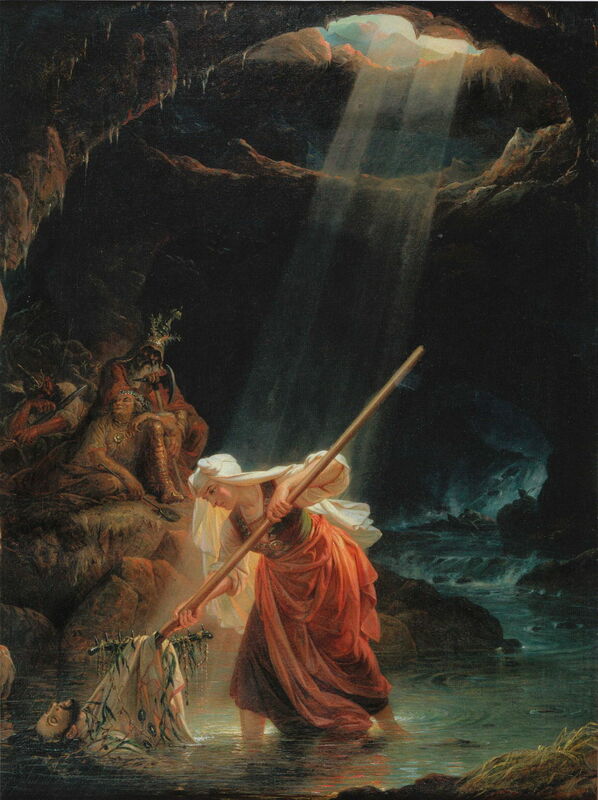 Väinämöinen makes love to Aino in the forest; but she returns home in grief and anger, and finally wanders away again, and is drowned while trying to swim out to some water-nymphs in a lake. Her mother weeps for her incessantly. 5. Väinämöinen fishes up Aino in the form of a salmon; but she escapes him, and his mother advises him to seek a bride in Pohjola, the North Country, sometimes identified with Lapland, but apparently still further north. 6. While Väinämöinen is riding over the water on his magic steed, Joukahainen shoots the horse under him. Väinämöinen falls into the water, and is driven onwards by a tempest, while Joukahainen returns to his mother, who upbraids him for shooting at the minstrel. 7. Väinämöinen is carried by an eagle to the neighbourhood of the Castle of Pohjola, where the chatelaine, Louhi, receives him hospitably, and offers him her beautiful daughter if he will forge for her the talisman called the Sampo. He replies that he cannot do so himself, but will send his brother Ilmarinen, so Louhi gives him a sledge in which to return home. 8. Väinämöinen, on his journey, finds the daughter of Louhi sitting on a rainbow weaving, and makes love to her. In trying to accomplish the tasks she sets him, he wounds himself severely, and drives away till he finds an old man who promises to stanch the blood. 9. The old man heals Väinämöinen by relating the origin of Iron, and by salving his wounds. 10. Väinämöinen returns home, and as Ilmarinen declines to go to Pohjola to forge the Sampo, he causes a whirlwind to carry him to the castle. Ilmarinen forges the Sampo, but the maiden declines to marry him at present, and he returns home disconsolate. 11-15. These Runos relate the early adventures of Lemminkainen. He carries off and marries the beautiful Kyllikki, but quarrels with her, and starts off to Pohjola to woo the daughter of Louhi. Louhi sets him various tasks, and at length he is slain, cast into the river of Tuoni, the death-god, and is hewed to pieces; but is rescued and resuscitated by his mother. 16-17. Väinämöinen regrets having renounced the daughter of Louhi in favour of Ilmarinen, and begins to build a boat, but cannot complete it without three magic words, which he seeks for in vain in Tuonela, the death-kingdom, but afterwards jumps down the throat of the dead giant, Antero Vipunen, and compels him to sing to him all his wisdom. 18-19. Väinämöinen and Ilmarinen travel to Pohjola, one by water and the other by land, and agree that the maiden shall make her choice between them. She prefers Ilmarinen, who is aided by his bride to perform all the tasks set him by Louhi. 20-25. The wedding is celebrated at Pohjola, an immense ox being slaughtered for the feast; after which ale is brewed by Osmotar, “Kaleva’s most beauteous daughter.” Every one is invited, except Lemminkainen, who is passed over as too quarrelsome and ill-mannered. Before the bride and bridegroom leave, they have to listen to long lectures about their future conduct. 26-30. Lemminkainen is enraged at not being invited to the wedding, forces his way into the Castle of Pohjola through the magical obstacles in his path, and slays the lord of the castle in a duel. He flies home, and his mother sends him to hide in a distant island where all the warriors are absent, and where he lives with the women till the return of the men, when he is again obliged to fly. He returns home, and finds the whole country laid waste, and only his mother in hiding. Against her advice, he persuades his old comrade Tiera to join him in another expedition against Pohjola, but Louhi sends the Frost against them, and they are driven back in great distress. 31-36. A chief named Untamo lays waste the territory of his brother Kalervo, and carries off his wife. She gives birth to Kullervo, who vows vengeance against Untamo in his cradle. Untamo brings Kullervo up as a slave, but as he spoils everything he touches, sells him to Ilmarinen. Ilmarinen’s wife ill-treats him, and he revenges himself by giving her over to be devoured by wolves and bears, and escapes to the forests, where he rejoins his family. One of his sisters has been lost, and meeting her accidentally and without knowing her, he carries her off. She throws herself into a torrent, and he returns home. His mother advises him to go into hiding, but first he makes war on Untamo, destroys him and his clan, and again returns home. Here he finds all his people dead, and everything desolate; so he wanders off into the forest, and falls on his own sword. 37-49. Ilmarinen forges himself a new wife of gold and silver, but cannot give her life or warmth, so he carries off another daughter of Louhi; but she angers him so much that he changes her into a seagull. Ilmarinen and Väinämöinen, who are afterwards joined by Lemminkainen, now undertake another expedition to Pohjola to carry off the Sampo. On the way, Väinämöinen constructs a kantele or harp of pikebone, and lulls Louhi and her people to sleep; but she pursues the robbers, and first the kantele is lost overboard, and then the Sampo is broken to pieces and lost in the sea. Väinämöinen saves enough to secure the prosperity of Kalevala, but Louhi only carries home a small and almost useless fragment. Väinämöinen then makes a new kantele of birchwood. Louhi brings pestilence on Kalevala, then sends a bear against the country, and lastly, steals away the sun and moon, hiding them in the stone mountain of Pohjola. Väinämöinen drives away the plagues, kills the bear, and renews fire from a conflagration caused by a spark sent down from heaven by the god Ukko. Ilmarinen then prepares chains for Louhi, and terrifies her into restoring the sun and moon to their original places. 50. The virgin Marjatta swallows a cranberry, and brings forth a son, who is proclaimed King of Karelia. Väinämöinen in great anger quits the country in his boat, but leaves the kantele and his songs behind him for the pleasure of the people. The above excerpt is subject to the standard Gutenberg Library licence. Posted in General, Language, Painting and tagged Ekman, Finland, Gallen-Kallela, Godenhjelm, Kalevala, Karelia, Keinänen, Muukka, narrative, painting. Bookmark the permalink. Thank you, Hoakley, for two excellent articles on the Kalevala. Wonderful illustrations and very clear writing. Much appreciated.